It was in July 1979, during my vacation in Switzerland, that (in a bookshop) I found a German booklet about Ships-in-Bottles called 'Buddelschiffe' written by Jochen Binikowski. (never heard of the name Binikowski; did not pay attention to it, ...... until later...) And suddenly I realised that this was going to be my 'HOBBY'; so beautiful, fascinating and unique. I had built lots of plastic kits before, but this was IT. I started to built the little ship as prescribed in the booklet. And then I built another one... and another; each time better and more beautiful (to me) than the one before. Then in January 1983, when I was in Hamburg (Germany) for my work, I remembered that one of my colleagues once gave me the address of a Mr. (and here he is again) Jochen Binikowski. Jochen makes and sells ships-in-bottles. I called my wife for the exact address, went to look him up and we met. Later I sent him a letter and photos of some of the models I made. In reply he asked me whether he might borrow some of my models for in his ‘Buddelschiff (bottleship) Museum’, which was in the 'Schulauer Fährhaus' in Wedel, just outside Hamburg, along the Elbe. Pity to say that the museum does not exist anymore. So my contribution to the museums collection is now home again; in my hobby room. Still, at that time, I wondered if there would be associations of SiB makers. I was thinking about seeking contact through a hobby magazine. 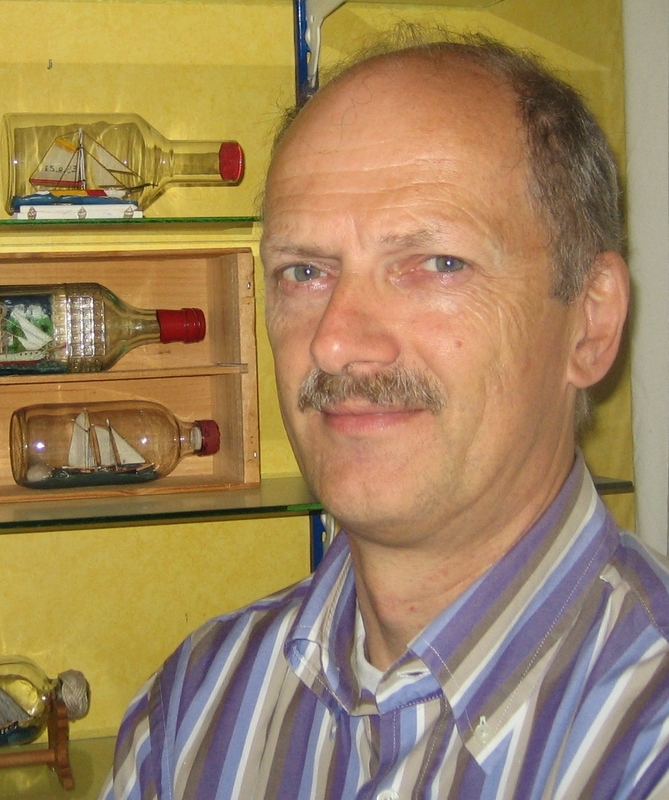 But at that time (beyond my knowledge) Jochen Binikowski passed on my name to the Japanese Association of Ships in Bottles. They sent me an invitation to join their 'First Japan International Ships-in-Bottles Exposition 1983'. Through that exposition and the commemorative book -published for that occasion- I got acquainted with the European Association (EASiB). At that time Aubrey Dunning was secretary of the European Association and also the editor of ‘Compass Card’. He lived in Utrecht, a big town close to where I lived at that time. He had seen my models in the book and we got in touch with each other. In August 1985 the Dutch ‘Rijks Post Spaarbank’ (Post Office Savings Bank), one of the main sponsors of SAIL Amsterdam, launched an advertising campaign. The theme was saving/collecting. I was invited to collaborate because of my collection of bottleships. Advertisements appeared and a booklet about saving (money) and collecting bottleships was published. As a consequence of the advertising campaign the hobby of ships in bottles became more widely known in Holland. This resulted in an increase in the number of Dutch members of the EASiB. An article published in the Amersfoortse Courant, a local newspaper, about me and my bottleship collection led to an invitation by the director of the Veluwe Museum in Harderwijk to organise an exhibition of bottleships in the museum. That was the opportunity for me to organise the first meeting of the Dutch makers of bottleships, which took place at the end of September 1985 in Harderwijk. That is the moment upon which the Dutch association has been established. Over the years I had the opportunity to appear in several local newspapers, magazines and even several times on TV. I have built about 40 bottleships and collected lots of articles, books and especially lots of pictures about/of Bottleships. Even 2500 pictures of different models from all over the world are waiting to be digitalized. Next to my 'self built models' I have collected 80 ‘patience’ bottles (SiB’s and other things in bottles) from builders from al over the world. Lots of ideas and my work for 'WELKOM aan BOORD’ make that I will not get bored ………and he went on making ships-in-bottles happily ever after.